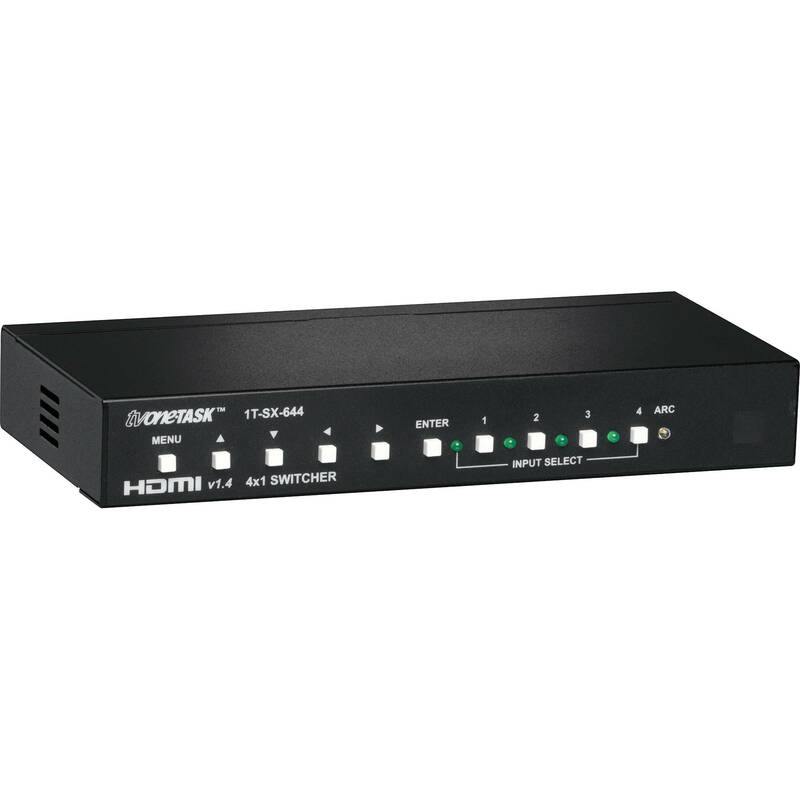 The oneTASK 1T-SX-644 4x1 1080p Switcher has four HDMI inputs with one HDMI and one digital coaxial output. It supports HDMI v1.4, enabling high-speed, bi-directional communication with support for 3D video, high-resolution audio, and ARC. Based on fast-switching technology, the unit is designed to eliminate delay when switching between HDMI sources. The switcher supports a maximum resolution of up to 1080p or 1920 x 1200. Box Dimensions (LxWxH) 11.15 x 7.35 x 2.85"
1T-SX-644 4x1 1080p Switcher is rated 4.3 out of 5 by 4. Rated 4 out of 5 by Chruch Tech Guy from Good quality switcher. Live use results in slight glitch. 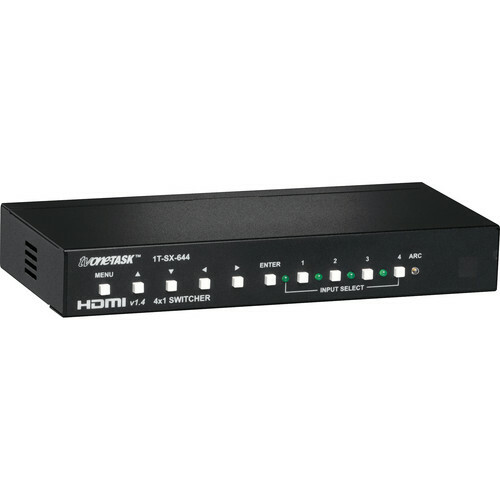 I was looking for a switcher that would be suitable for switching live HDMI between multiple sources. This switcher was the best that I could find because it cached the information about the HDMI stream (EDID data) so the HDMI stream did not need to renegotiate if you switched between sources with the same video type (e.g. 1080p). Even so the video itself needed to re-synchronize which causes a half second glitch. Ultimately I selected a Cerevo Live Wedge and returned this unit. 4x the cost, but lots more features and totally seamless switching. Rated 4 out of 5 by hclmed from Fast enough This has managed EIDE so, while it's not instantaneous, it's within 3-5 seconds, which is much better than those that have to renegociate HDCP. It includes an IR extender with the remote, and has worked dependably so far. It would have been 5 stars if it was 1 or 2 seconds faster. Rated 4 out of 5 by Jim from Decent Switcher Bough to switch between 2 laptops and a digital camera. Works great. 3-5 sec delay between inputs. Rated 5 out of 5 by Falcon91Wolvrn03 from The Best 3D HDMI Switch of 2011! I needed a 3D HDMI switch to go with my 3D HDMI monitor. My monitor doesn't have external sound connections, so I also needed a switcher that included audio out so I could connect high quality speakers. Although there were many 3D HDMI switchers, I found only three (as of Dec 2011) that were HDMI 1.4 compliant. The rest were HDMI 1.3 which means they can't support full 1080p resolution in 3D. Of the three HDMI 1.4 switchers, I eliminated one because it didn't have audio out. I tried a second, but it took 30 seconds to switch between channels, and often didn't switch at all (just showed a blank screen). Then I learned that HDMI switchers take much longer to switch on HDMI monitors than they do on HDMI TVs (this first switcher took only two seconds to switch when I tested it on my TV). Next, I tried a full blown receiver, but it took up too much space on my desk, and it also took 30 seconds to switch between channels when using my monitor. Finally, I decided to try the TV One 1T-SX-644. I was skeptical, as it was over $100 less than the other switchers I tried, so I was concerned about the quality. However, upon receiving it, I found that it comes in a well-constructed, solid box; no quality issues at all. The size is also nice much more compact than other switchers (only 7.9 inches wide as opposed to 10 inches). It is heavy, so it stays put after connecting the HDMI cables (you can also get an optional rack mount kit). Best of all, this switched between channels in only 5 seconds rather than 30 seconds as the other switchers did. I suspect that if you use this with an HDMI TV rather than an HDMI monitor, the switching time will be much less. The only minor issue I have with this is that the audio out is coaxial with no Toslink connection (which seems to be more common than coax), but a converter is inexpensive. I'm extremely happy with this. It's far better than the other options I tried and far less expensive too.